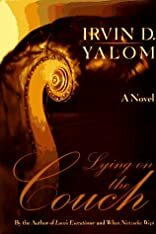 There is plenty of lying going on in psychotherapy offices to be found in Irvin D. Yalom's novel Lying on the Couch, and the lying is of every type defined in your average modern dictionary. Among those doing the lying are Carolyn, who hopes to ruin the career of psychotherapist Ernest Lash because she believes his advice led her husband to seek a divorce. Then there is the gambler whose plan is to lure another psychotherapist into malpractice so he can sue and pay off his debts. In Yalom's world, the relationship between therapist and patient is a tricky one indeed, and it's sometimes hard to tell who needs advice and counseling more--the patient lying on the couch or therapist sitting nearby.